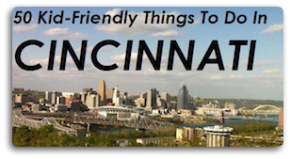 Tis the weekend to celebrate our favorite dads, so don’t miss Kristin’s awesome Father’s Day Fun in Cincinnati post. It’s chock-full of cool ideas for how to spend some quality time with Dad. (Plus there are some cute pics of FFC’s favorite fathers, including mine!) Otherwise, there are plenty more fun things to do with the fam this weekend. Stay cool and have a great time! If your kids spend way too much time hanging around the monkey bars, maybe you should enroll them in Children’s Flying Trapeze School. With the help of The Amazing Portable Circus, they’ll learn to fly circus-style at Newport on the Levee. Ages 6-12, must be accompanied by adult. $7, registration required. 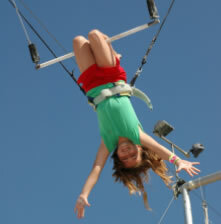 Call 513-921-5454 or visit www.amazingportablecircus.com for information. Friday, Saturday and Sunday, 9 a.m. – 4 p.m.
Help teach your children about an important part of American history at Juneteenth Festival, an annual celebration of the end of slavery in 1865. This festival is held at Seasongood Pavilion and Mirror Lake in Eden Park. Enjoy music, informational displays, health screenings, childrens’ activities, job seminars, food vendors and more. Free. For more information, call 513-631-7289 or visit www.juneteenthcincinnati.org. Saturday, noon to 9 p.m.; Sunday, 3 to 7 p.m. Think you have the next LeBron James in your house? Give your budding basketball star (ages 4 to 7) a leg up at Chris Mack Little Dribblers Basketball Camp, held at the Cintas Center, Auxiliary Gym, Schmidt Fieldhouse and O’Conner Sports Center. Participants will learn fundamentals of the game, teamwork and sportsmanship. $55 per camper, per session, registration required. Call 513-745-3417 or visit the camp’s Facebook page for details. First session is Friday, 9 a.m. to noon. Whether you have fond memories of the good ol’ camp days or just want to check it out for the kiddos, the YMCA Camp Kern 100th Celebration sounds like a lot of fun. You can enjoy all the camp classics: Horseback riding, climbing walls, arts and crafts, archery and air rifles. Plus listen to tunes by the Banana Slugs String Band and Jim McCutcheon. Free. Call 513-932-3756 or visit the camp website for details. 8 a.m. – 10 p.m.
Football fans young and old will dig the All Pro Dad Father and Kids Experience at Paul Brown Stadium. Dads and kids ages 5 and up can play sports and activities, including tips on being a better father. The experience is hosted by Anthony Munoz, pro football hall of famer. For more information, call 813-222-8300. Registration is only $15 per family, which includes admission for one adult and up to four children. Advanced registration is required and early registration is encouraged. Encourage healthy eating and maybe even get some extra help with cooking — take your 5- to 12-year-olds to Kids in the Kitchen at Whole Foods Market Mason. This is a free summer Saturday series of cooking classes, starting this Saturday with fruit burritos (yum!). Registration is required, so call 513-398-9358 to get on the list. As the sun goes down, head to Fountain Square for a free “drive in” movie night — without the cars. At Toyota’s Movie Night, you can watch Astro Boy and Steamboy on the big screen from 7 to 11 p.m. Families bring their own blankets, chairs, and pillows. Adult beverages, soft drinks, and movie snacks are available for purchase. Concessions will include Skyline coneys, soft pretzels, nachos, candy bars, and kettle corn! This weekend marks the official start of summer, the Summer Solstice. Celebrate with a Yogic Takeover of Fountain Square – this event is free and open to all. Enjoy fun events for the whole family, including yoga-asana practices, live music, an eco-boutique and delicious vegan treats. Connect with the greater community, practice peace in action and learn about what we can do to honor the earth and all of her creatures, living sustainably and in harmony with all of life all while in the middle of the city at Fountain Square. Noon to 4 p.m.